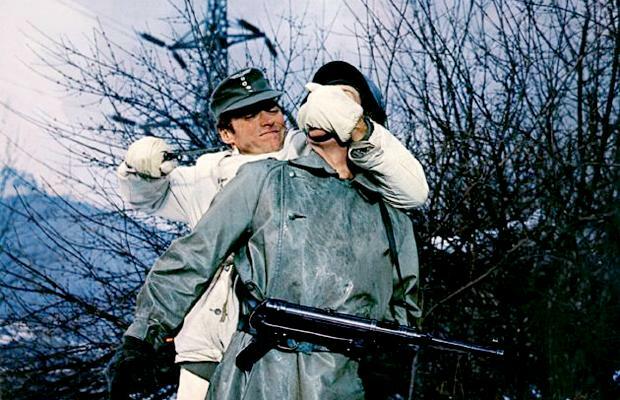 A World War Two fictional commando raid adventure, Where Eagles Dare is all-in with the action, the intrigue, the double-crosses, the incredible stunts, the magnificent scenery, and the blooming nonsense. 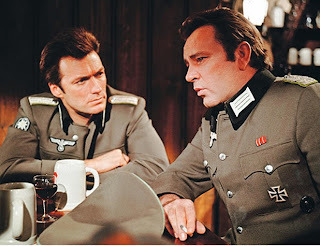 British Major John Smith (Richard Burton) leads a group of seven commandos in an assault on Schloss Adler, a German fortress wedged into the Alps in Bavaria. Lieutenant Schaffer (Clint Eastwood) of the US Army Rangers is the only American team member. The objective of the mission is to rescue U.S. General George Carnaby, who has been captured by the Germans and could be tortured to give up secrets about the upcoming Allied plan to open a second front in Europe. After an aerial drop, two members of the commando team meet suspicious deaths. But Smith has an ace up his sleeve in the form of Mary (Mary Ure), a secret commando, and he establishes contact with local undercover agent Heidi (Ingrid Pitt), who helps Mary to infiltrate the castle. In German disguise, Smith and Schaffer cause chaos among the German ranks by blowing up an ammunition depot in the local village, then make their way into the fortress by riding on top of the cable car. Once inside, they encounter the German commanders General Rosemeyer (Ferdy Mayne) and Colonel Kramer (Anton Diffring), as well as Major von Hapen (Derren Nesbitt), a Gestapo officer. Before Carnaby can be rescued, Smith has many surprises to unveil, and together Smith and Schaffer have to battle overwhelming forces to complete their mission and make their escape. Written by Alistair MacLean specifically for the screen, Where Eagles Dare is undeniably exciting. The film does not waste any time with context or background, as it opens with the commandos already en-route to their mission, and the objective is revealed in a brief flashback. And as soon as the team lands on the snowy mountainside the intrigue kicks in as the body count starts, Smith unsure who to trust, not fully surprised that there may be traitor among the group, and seemingly running his own mission within a mission with the help of Mary as a secret ally. From there director Brian G. Hutton keeps the pace on fast forward, the danger ever tightening, and the stunts spectacular. Outnumbered and outgunned, Smith and Schaffer are the epitome of cool, seemingly trapped but actually trapping their captors, and planning several steps ahead in terms of dishing out the destruction. The film is packed with eye-popping stunts, including a death-defying jump between two moving cable cars, and no shortage of impressive explosions. The Arthur Ibbetson cinematography, elegantly enhanced by a Ron Goodwin soundtrack, finds dramatic panoramas in the Austrian countryside. With many of the scenes taking place in the dark, the film has a crisp, deep blue palette, a chilly aesthetic of deep snow high in the mountains, a place of remote beauty that still could not escape the dominance of the German war machine. The castle interiors were filmed at Burg Hohenwerfen, in Werfen, Austria, and here Hutton enjoys the combination of imposing, expansive, elaborately decorated grand rooms with multiple doors, and a rabbit's warren of corridors and side rooms perfect for deadly games of hide, seek, and kill. Where Eagles Dare does push its luck, and in some scenes disintegrates into comic book territory. The bad guys do exactly what Smith and Schaffer need them to do in order for everything to work out, and the few-against-many battles do cross the line into ridiculous superhero territory. And not satisfied with the impossible drama of a small force invading an impregnable fort at the top of a commanding Alpine mountain, the plot eventually spirals into a dizzying story of double agents literally and figuratively backstabbing each other, and veers close to too-complicated territory. But Burton and Eastwood are there to save the day. The grizzled veteran and up-and-coming star are cool under pressure, red hot in the fire fights, and indefatigable when it comes to completing their mission. One wise old eagle, one young eagle, both full of vigorous daring.